I enjoyed Jimmy's Taverna, close by, great food. the property is very well located the hosts are the most wonderful people! the mesostrato restaurant is great! Gorgeous and very clean rooms, great hosts, food at the taverna was great as well! Very relaxed and comfortable stay. We enjoyed the traditional Greek atmosphere of the Island. Very near the beach and the Skiathos Princess hotel where we were attending a wedding. Basic rooms but spotlessly clean. Staff went out of their way to be accommodating. On site restaurant was excellent- we dined there daily. We stayed here for a week and we had a wonderful time. Maroula and her parents are excellent hosts, we felt like were their guests, not their clients. The cleaning is impeccable, the location is really close to the beach, there is a tavern right there and you also have 2 shops nearby. Also, the bus station is right in front of it. Thank you for everything! We had a wonderful time! I have spent summer holidays in many places but I have'nt find such a perfect clean place!The cleanliness of the room is fabulous,confortable beds and the family taverna,Mesostrato,is a very delicious and place to eat!Bonus a marvelous garden!Both Paris Guesthouse and Mesostrato taverna are decorated in a very good taste! 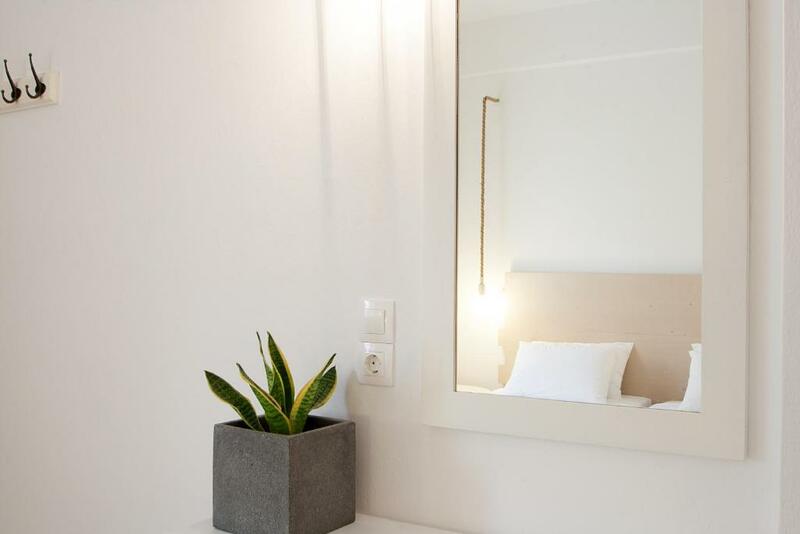 Lock in a great price for Paris Guesthouse – rated 9.1 by recent guests! 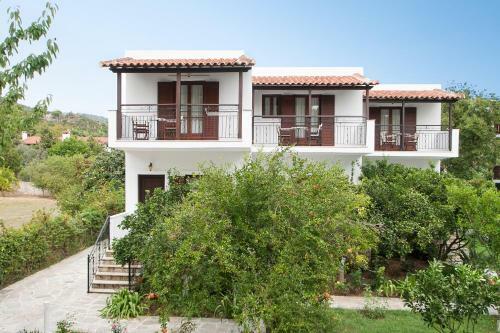 Family-run Paris Guesthouse is 300 feet from Agia Paraskevi Beach in Skiathos. It offers self-catered rooms with air conditioning and a furnished balcony overlooking the grounds. All studios have free Wi-Fi. Rooms at Guesthouse Paris have a kitchenette with a fridge. Each includes a private bathroom with shower and a hairdryer. The shaded balcony is ideal for a little breakfast or a relaxing drink. Agia Paraskevi Beach offers many water sports facilities. Skiathos Town is 4 miles away. Famous Koukounaries Beach is a 10-minute drive from the property. Free private parking is available on site. 뀐 Located in the top-rated area in Agia Paraskevi, this property has an excellent location score of 8.9! When would you like to stay at Paris Guesthouse? Offering a shaded balcony, this studio has a kitchenette with fridge. The private bathroom includes a shower and hairdryer. House Rules Paris Guesthouse takes special requests – add in the next step! 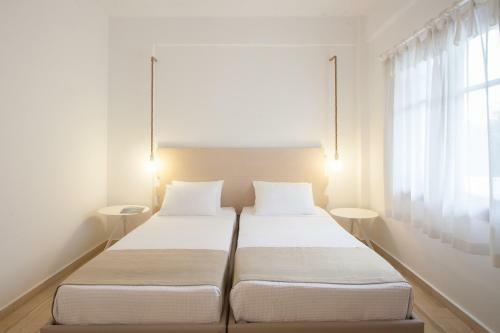 One child from 10 to 15 years is charged EUR 10 per person per night in an extra bed. Paris Guesthouse accepts these cards and reserves the right to temporarily hold an amount prior to arrival. I didn't like almost everything. A lot of mosquitoes, ants and moths(including inside the room). Too noisy due to road & taverna proximity(at least until 1am). I had 2 separate beds even though I was promised a double. The beds were uncomfortable of course. For 10 days you get only one soap(approximately 30 gram), no shower gel, no shampoo. The draining system of the shower was clogged. No shower support. You only get a receipt if you ask for it (if you insist and come for it later, after you've checked out, it's not like they had 10 days to prepare it). The first day we've stayed I said to my host there were irregularities and that we had to talk about that tomorrow, but tomorrow never came... So yap this is my review. Forgot to mention 90€/day is not a good value price ratio for this booking. Mosquito nest on the windows can make a havenly experience at Paris Guesthouse. The family the run the apartments are very friendly and nothing is too much trouble, really clean rooms, great taverna attached to the property and the beach is 2 mins across the road! Great location. Nothing. Staff/ location / accommodation were perfect. A great, if somewhat basic accommodation which had everything we needed. Went for a family wedding at the nearby Princess hotel and the location for us was perfect, Paris being just across the road. A short walk to a beautiful beach countered the lack of a pool, but the on site restaurant run by the same owners is excellent and we dined there daily. Overall an excellent place which we would highly recommend. 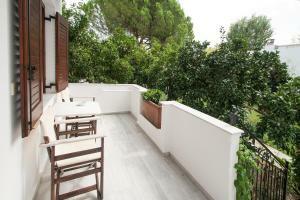 Lovely apartment, very clean with everything you need and located in a nice garden. The owners were really nice and always on hand when I needed assistance. The position is very convenient, there is a nice beach just 2 mins away, the bus stop is just outside and there are lots of tavernas and a supermarket close by. 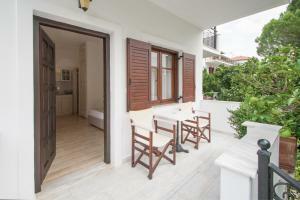 The owners also have a very good taverna on the apartment’s premises. Definitely recommended! Lack of necessary household appliances - coffee tea machine, microwave, hair dryer. Toilet paper only on request, no shampoo. The bed mattress was very soft, I slept very badly. Mosquitos outside, very venomous in the evening, you need protection cream. Close to the beach and bus station. Very clean, new furniture, parking space inside, has a very good traditional tavern.